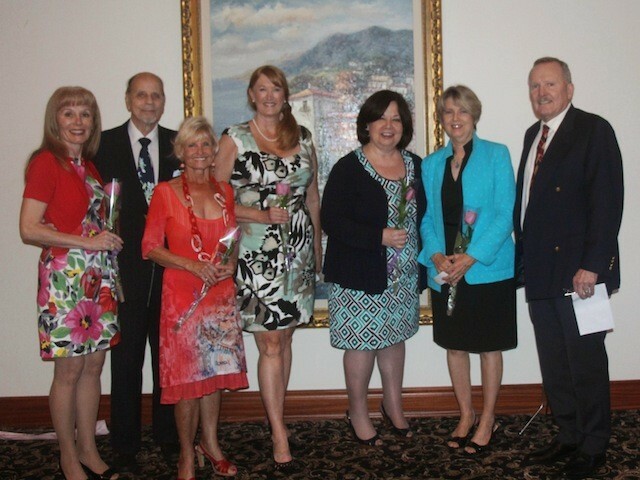 It was a lovely spring day on Thursday, May 7th for the Opera Society’s Spring Luncheon and Installation of Officers for 2015-2016. As guests gathered in the Lounge of the Bistro Mezzaluna, Ann Rentoumis graciously entertained us on the piano as we sipped our champagne. After socializing for a while we headed upstairs to the Lighthouse room for the membership meeting and luncheon. As the guests’ lunch menu preferences were being taken, a brief business meeting was conducted. Karen Mathieson, welcomed guests and acknowledged our special guests, Susan Danis, General Director and CEO, Florida Grand Opera, and Justin Moss, FGO’s Director of Broward Operations & Outreach. Our two new members in attendance, Dr. Jacqueline Hayward and Mr. Jeffrey Blum were introduced and presented with a welcoming rose. President Eric Koskoff then presented gifts of acknowledgement to the Opera Society 2014-2015 Officers. We were then honored to have Susan Danis, General Director & CEO present an overview of Florida Grand Opera’s 2015-2016 Season. Bistro Mezzaluna served a lovely lunch consisting of a choice of three entrees: wedge salad with grilled chicken, grilled salmon, or Rigatoni Bolognese. Desert was key lime pie. It was a delightful event everyone enjoyed. Special thanks to Isobel Sturgeon for the lovely table decorations, to our gifted pianist Ann Rentoumis, and to our photographer Betty Young for the wonderful pictures. Previous post: The Opera Society Goes To Boca! Next post: Over 50 Delight in the Season’s First Lyrical Luncheon!